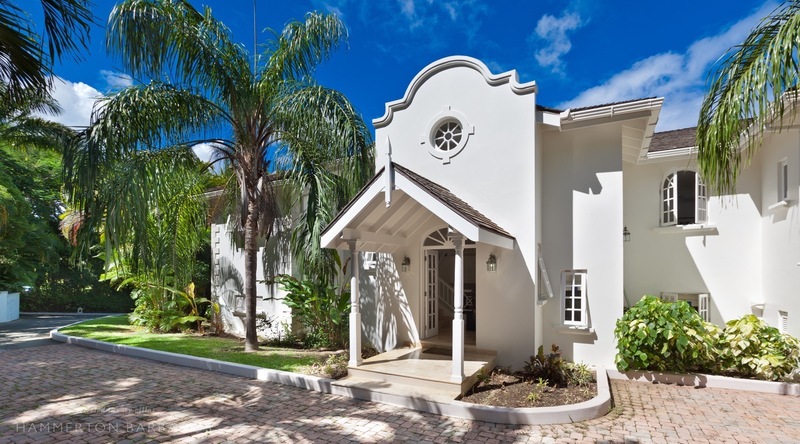 A beautiful villa located within the Sandy Lane estate. 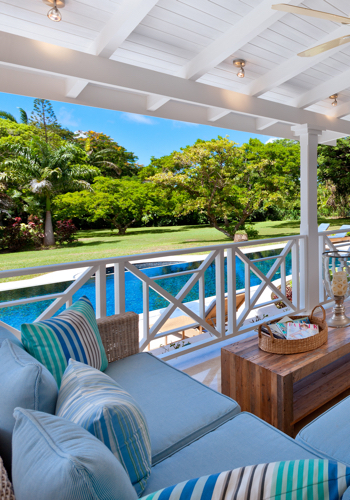 A colonial style terrace overlooks the pool and extensive gardens - a true haven only minutes from the beach. 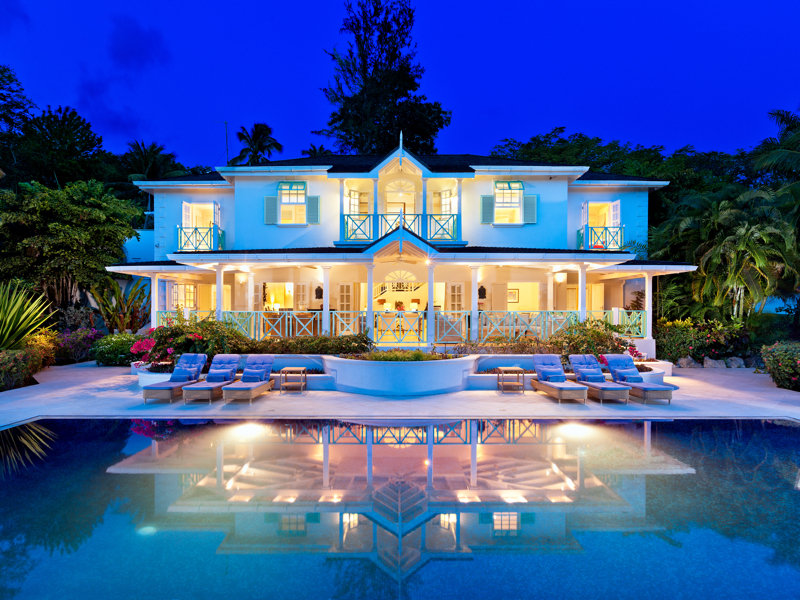 Moon Dance is a stunning private residence set in almost two acres of beautifully landscaped gardens at the heart of Barbados’ renowned Sandy Lane Estate. 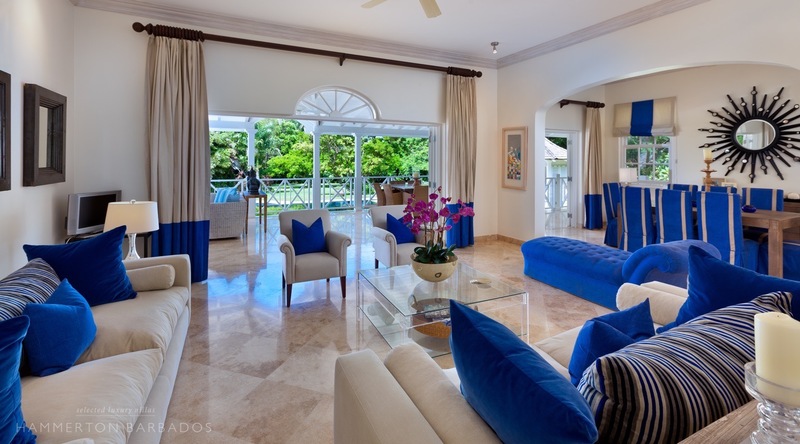 The villa faces west and overlooks the 8th hole of the famous golf course. 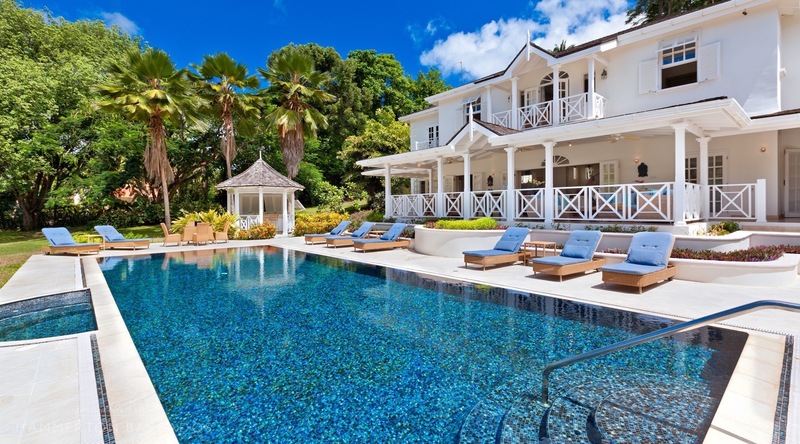 Only a short walk down the 9th fairway, past the Old Nine Clubhouse and Hotel Tennis courts, and across the road is the main entrance to The Sandy Lane Hotel and the Sandy Lane Property Owners beach facility on the island's finest west coast beach. The villa offers total privacy in its very quiet location at the end of a 'no through road' behind electric gates and security fencing. 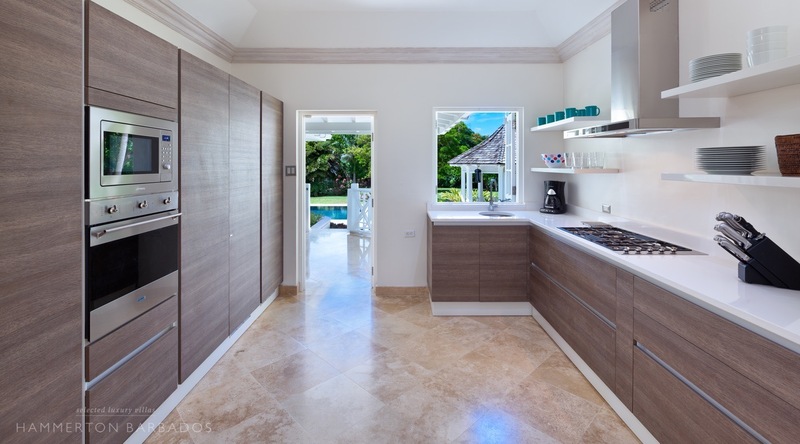 It's contemporary interior design blends natural and vibrant colours harmoniously and the spacious indoor and outdoor living areas make it the ideal holiday home for a large family or group of friends. 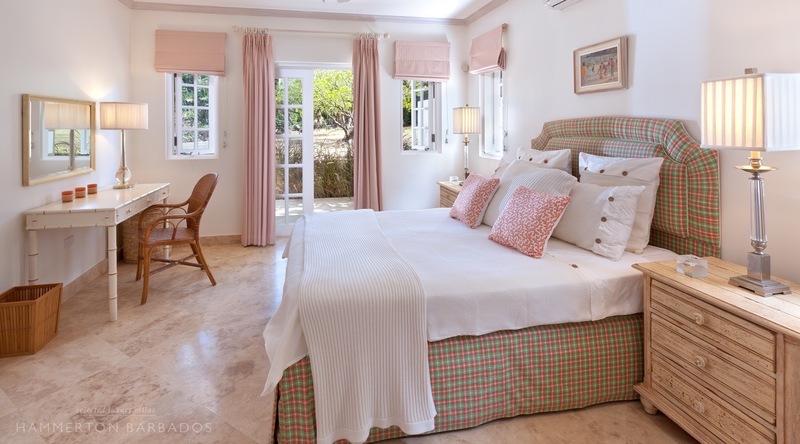 The main villa includes four luxurious double bedrooms that face the garden with French doors. They are all air conditioned with ceiling fans. 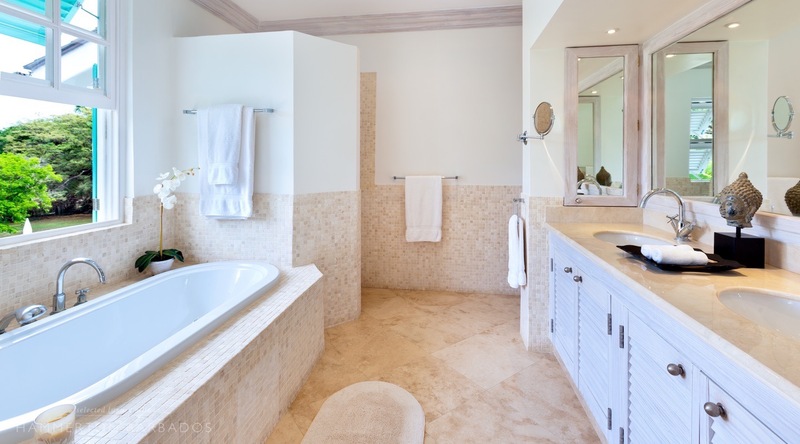 All four feature en-suite baths and separate showers. 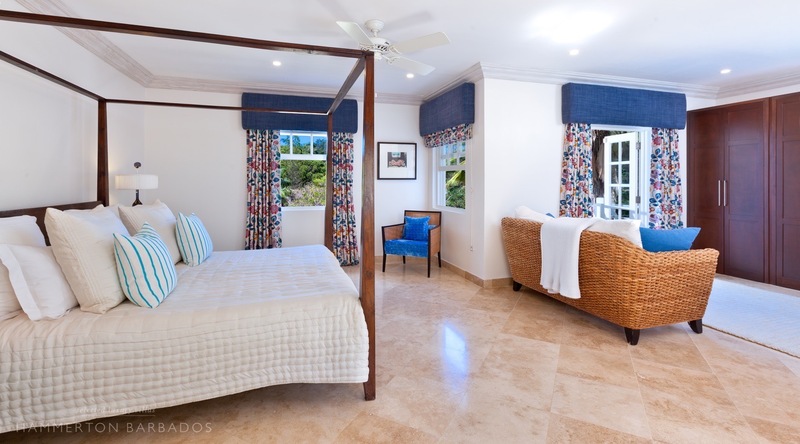 The newly configured large master suite also features an air-conditioned bathroom. 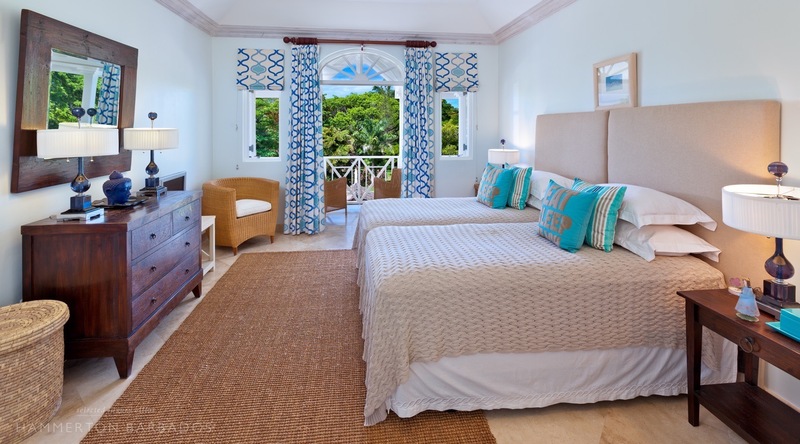 The main guest suite with a private balcony (at the centre of the house) has a twin beds, a large walk-in-closet and large bath with views over the garden. 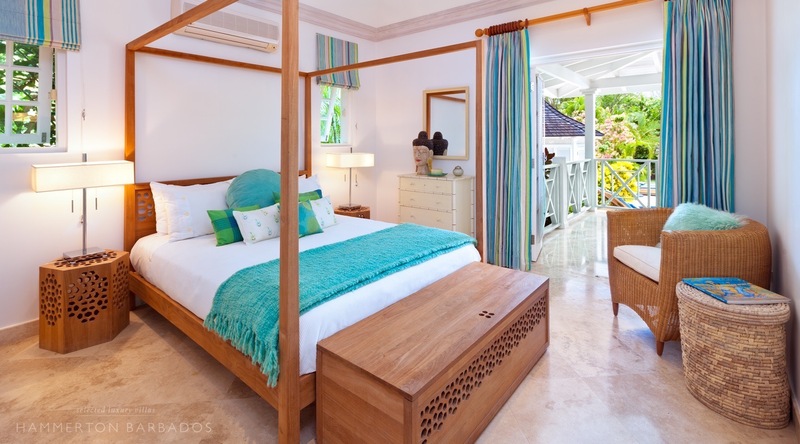 King "four poster" beds are a feature of the final two bedroom suites (one of which is on the ground floor). 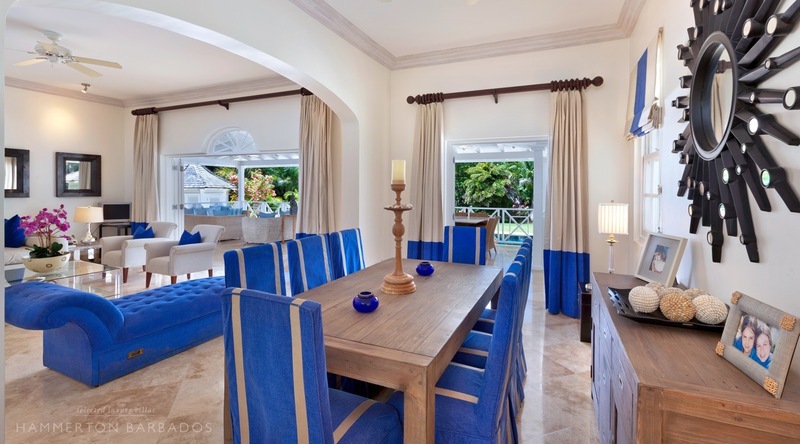 A spacious open plan-living and dining room, with seating for 8 people, opens on to a spacious covered patio, overlooking the swimming pool and gardens. 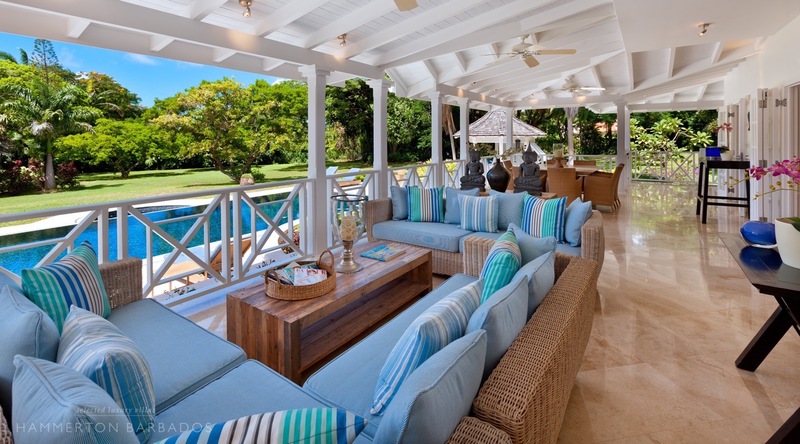 There is further lounge seating and a 10/12 seat dining area for enjoying al fresco meals. A further poolside dining table seats 6. There is a fully-equipped and air-conditioned Italian Scavolini kitchen which was fitted in 2015 and if you can't drag yourself away, there is a separate air-conditioned TV room with Apple TV equipped 40 inch television and DVD player. The house has Internet Wi-Fi, VOIP telephone and a fax machine. 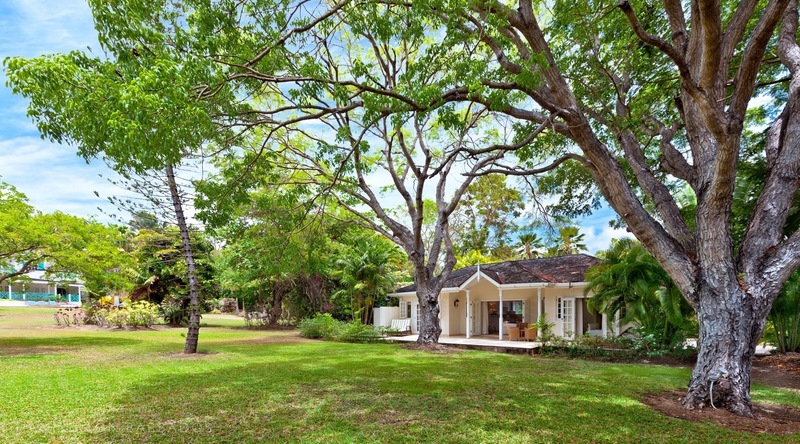 In the grounds is a separate self-contained 2 bedroom (air conditioned) cottage with its own kitchen/lounge area and Mahogany shaded patio. 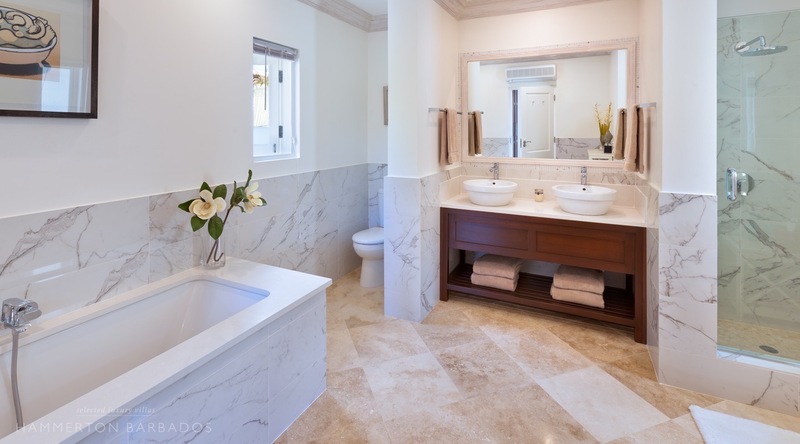 This is an ideal place for extra guests looking for a little more privacy. There is also a fairly simple room above the garage with two single beds which could accommodate two youngsters or would be ideal for a nanny. Guests at Moon Dance can enjoy relaxing around the beautiful Japanese mosaic pool and jacuzzi, and the pool has the added benefit of having low chemical salt water. Surplus sun-loungers, two gazebos, one with a bar and one with bathroom and shower facilities, ensure you have all you need to spend an uninterrupted day by the pool. The above prices include local taxes and service charges where applicable. As the Barbados Government is currently changing the way it taxes rental properties, we will reconfirm all prices at the time of booking. A security deposit of US$3000 will be required on arrival. 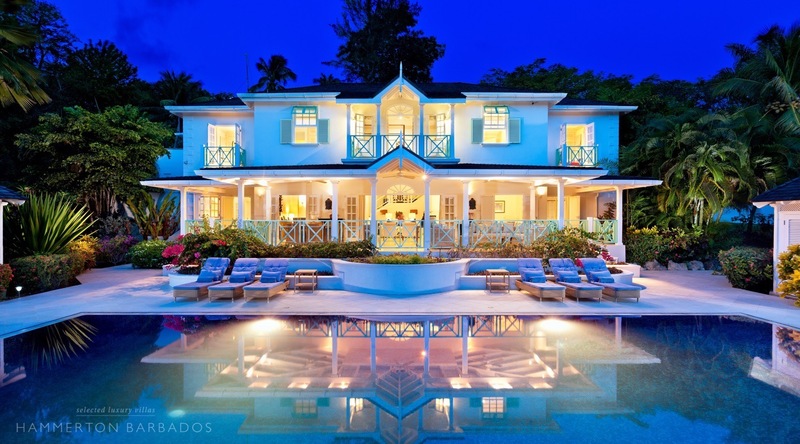 This was our second visit to Barbados and we had a truly wonderful holiday, falling back in love with the island, the way of life and the house we rented for 2 weeks. The staff were so accommodating, the quality of the house was beyond perfect and everyone felt at home from the word go.